Are you preparing for the Real Estate Appraisers’ Exam of the PRC? The CES Real Estate Academy will offer some internships to help you earn the balance of 60 hours. The RESA Law IRR requires aspiring real estate practitioners who plan to take the licensure exam to earn 120 units in real estate subjects. Good luck to all of you who are preparing for the Real Estate Appraisers Exam which will be conducted by the PRC. NOTE: While some people have been asking if the PRC’s Real Estate Appraisers Licensure Exams have been moved to July 2011, a quick check of the PRC’s website shows that the REA Exams are scheduled for May 29, 2011. Still, CREASAT providers who have previously scheduled their Real Estate Appraisers Review for April 2011 have, as can be seen on this webpage, moved their offered review to May 2011. Hi, I’m from Occidental Mindoro..kindly inform me if you have any schedule of review or online review for i’m longing to be a license real estate appraiser. I grab the opportunity of taking the first board exam for real estate appraiser but unfortunately failed. Any materials/books from your good office can make me more confident in taking board exam for second time around. I already have a valid certification of 120 hours accredited training from Dept. of Finance because I’m doing an actual appraisal service in our municipality (LGU). Can you you please give me a rough estimate of my budget just for review. I hope you can help me in this matter. Thank you and God Bless You all!!! [From the Admin] Hello! When we get word of review classes for real estate appraisers, we’ll post the info online right away. Thanks! hi i was supposed to take exam as REB kaso my fren lawyer told me that its course now in college how True? If i can still take exam i want to know ur office in Cebu baka makahabol pa ako for PRC exam this year.Hope to hear from you soon Thank you..
[From the Admin] We haven’t seen any course yet on BS Real Estate Service or BS Real Estate Management. And assuming that such a course exists starting June 2011, the earliest batch of graduates will earn their degree in March 2015. It looks like, for now, earning a college degree will do (aside from the 120 units in real estate subjects, of course). could you update me when is the next real estate 120hours review? 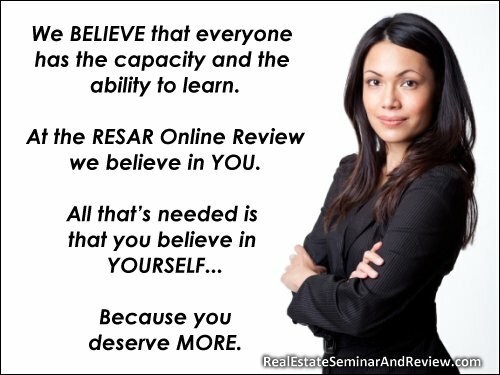 [From the Admin] Please join the RESAR Online Review Announcement List, because we will broadcast to that list via email details of the upcoming review classes for those preparing for the PRC’s upcoming exams for real estate professionals. do you conduct CRESAT in mindanao particularly in CDO or Ozamis city? [From the Admin] At the moment, the people organizing CRESATs are holding these in either Makati or Cubao, Quezon City. If ever we hear of CRESATs in CDO or Ozamis City, we will post the info online. Thanks! [From the Admin] Please budget around P20,000 for a 120-hour Comprehensive Real Estate Seminar and Review (CRESAR). As soon as we get info about Bicol-based CRESARs, we will post the info online. Thanks! [From the Admin] We will be on the lookout for updates from the Cesar Santos Real Estate Academy. Thanks! Due to numerous requests in our inquiries, CES ACADEMY is in the works of stretching the 60 hours offering to a full 120-hour Comprehensive Real Estate Seminar (CRES) for Appraisers. Please stand by for our FINAL SCHEDULE of seminars from May to July, 2011. We will be posting it here and to our Facebook Page. To those who have reserved, you will be getting an update thru text and email regarding the additional dates. Thank you for your continuous patronage to our Academy! i read that The CES Real Estate Academy will offer internship for appraisers, how much would we pay for this? Regarding internship, do i have to have an appraiser’s experience or the creasar is enough to qualify me in your planned internship? [From the Admin] Hello! We are forwarding you inquiry to the CES Real Estate Academy. Thanks! after earning 60 hrs of creasat, how much should we allot for the ojt or internship? [From the Admin] Please allot 60 hours of OJT, and kindly secure a Certification from the company where you earned your 60 OJT hours. If you go for the 60 hours review + 60 hours OJT option, be sure to apply for the exam at the PRC early. Based on past experience, the PRC reportedly processed Exam Application Permits of those with 120 hours of CRESAR faster than those with 60 hours CRESAR + 60 hours OJT. Some of those with 60+60 certifications had their Exam Application Permits reviewed for a few more days. what is the qualification for appraiser??? may years of experience ba ng broker???? [From the Admin] You need to be a college graduate (diploma), and you need to have earned 120 units in real estate subjects. Thanks! Cesar E. Santos Real Estate Academy, Inc.